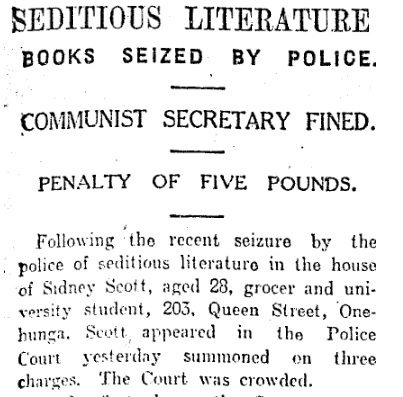 Prominent Auckland communist Sidney Scott was convicted over books considered seditious. Sidney Scott's troubles began when he imported four copies of a book edited by the Russian revolutionary Nikolai Bukharin. A grocer's assistant, an Auckland University College student of politics and the secretary of the Auckland branch of the Communist Party of New Zealand, Scott, 28, had to stand aside when the police came calling. Armed with a search warrant, Detective Sergeant James Bickerdike and colleagues seized a stack of books and party records from Scott's home at 203 Queen St, Onehunga, on July 14, 1928. The Soviet Union was ruled by communism and even in New Zealand the Labour Party under leader Harry Holland was still expecting the imminent demise of capitalism. The offending items in Scott's trove were four copies of the Bukharin volume Elements of Political Education and 12 of Party Training Manual, published by the Communist Party of Australia. The police, acting under the War Regulations Continuance Act, said the books advocated violence and expressed seditious intentions. Sedition is the inciting of public disorder or rebellion against state authority. Scott was charged with possessing the books for sale or distribution, and with importing books which advocated violence. He admitted two of the charges and pleaded not guilty - but was convicted - on a third that related to the communist training manual. He was fined and had to pay costs, the sum amounting to more than £14 (around $1400 in today's money). A Herald report indicated the prosecutor, Mr VN Hubble, was intrigued by communist procedure. Quoting party correspondence seized by the police, he noted they were signed, "Your revolutionary brother", "comrade", "with revolutionary greetings", or "Yours in revolt". Mystery on the mountain: What killed five on Tasman Glacier? The magistrate, Mr FK Hunt, chimed in: "Bright, cheerful sort of greetings they are, too!" More seriously, Hubble said the Australian manual "stirred up class hostility". Hunt quoted a passage in which the author said Ramsay MacDonald's British Government had "demonstrated quite clearly the necessity to break up and destroy the capitalist State machinery of bureaucracy, the courts of justice, military and police apparatus, and replace it by a self-governing mass organisation of workers who would combine legislative and executive powers". It wasn't a right and proper publication to have circulated, Hunt concluded. Scott said the books had arrived the morning the police called and hadn't even been read. He went on to have further brushes with the law. The Dictionary of New Zealand Biography says Scott was active in the Unemployed Workers' Movement and its Anti-Eviction Committee. In 1934, he was the main organiser of a free-speech campaign seeking the return of street-side politics, which had been restricted by the Auckland City Council in response to the Depression riot on the CBD Queen St in 1932. Charged with holding a meeting without a permit, inciting disorder and obstructing police, Scott was jailed for a week. A founder of the Auckland branch of the Communist Party in 1921, he went on - despite being blinded by glaucoma in the early 1940s - to become editor of the People's Voice and later the party's general secretary. But he fell out with the party, finally quitting after the Soviet Union's 1956 invasion of Hungary, and rediscovered religion. He died in 1970.